A videowall is big like a poster, in motion like a movie, topical like a news paper. ACT´s giant Outdoor LED-videowall solutions are a medium, perfect for advertising, news, sport and traffic. Specially developed for the presentation of all kinds of source materials, live-video, tv-spots, animations and graphics, images or normal text, everything can be shown on the ledwall and updated in realtime. Therefore you can use every software where you can scale the picture size to the resolution of your videowall. The ledwall is connected over fibre optic cables or cat5 cables to your player-pc and shows cloned 1:1 a part of your pc-monitor. It´s an open system, the possibilities are near unlimited. 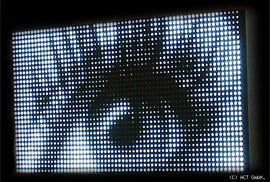 LED-screens also often used for indoor installations. Size, brightness, format: all-around where you come up against limiting factors by using normal monitors, LED-videowalls can prove its superiority! For special sizes ACT´s indoor LED videoscreens are a optimal solutions, for example high but small LED video-pillars, or discontinuous videowall sizes, or big videowalls mounted on the ceiling, many interesting solutions are possible, ACT is the right partner for projects like this. ACT provides full assistance from the vision to the realisation. Our goal is to deliver for each project the perfect led-videowall! 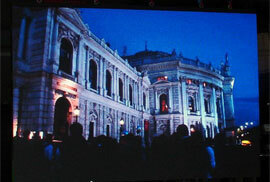 In general, the large-scale Video Displays are known as videowall or videoscreen. There is no concrete defination about the minimum size to declare as videowall. But with edge lengths more then two meters it´s certainly not wrong to use the term videowall. This term is used for led-videosigns with edge lenghts between about 80 to 200 cm. For using outdoor, ACT designed new series of led-videoposter with nice frame and little curved front-glass. This new version is available in popular DIN-A1 and A0 format. Video-banner and led-perimeter displays are no special defined formats. A perimeter displays workes like a videowall, just the size is different, it´s as long display like a typical scrolling message display. But it´s fullcolour, you can show also graphics, logos, animations, video- and flashfiles. If it´s vertical used, we say led-pillar or video-pillar. Our multi-pixel works with 4 leds per pixel, two red leds, one green led and one blue led. Each pixel combines with his physical neighbour pixel a new pixel. This pixel between is then called multi-pixel. On this way we can double the number of pixels in the length and in the height. Using this intelligent pixel controlling feature allows a 400% increase in image quality! A few manufacturers try to realize this also with just 3 leds per pixel, but this effect is not the same. For human eye it is not a much better picture quality compared to the physical resolution. It´s then more a “marketing virtual pixel”. This is the “classic” version with 3 led colors per pixel, one red, one green and one blue led color (RGB). This can be realized with DIP-leds or SMD-leds (SMD = surface-mounted device). SMD-leds can be made in different very small sizes with a big viewing angle. This means a led video screens with a very small pixel pitch can be realized. That´s why SMD leds mostly used for indoor screens where you have often a much smaller viewing distance compared to led outdoor screens. SMD 3in1 signify all 3 chips (red, green, blue) are packed in one SMD-led. this means then one SMD-led is one physical pixel. These SMD 3in1 leds can show all colors, incl. white color. LED-displays for indoor use are different to LED-videowalls for outdoor use. Indoor signs must not made waterproofed and specially the brightness of the leds are much lower then outdoor screens. ACT offers indoor videopanels mostly with SMD 3in1 leds, popular pixel pitch is starting with 4mm, often 6mm or 10mm are used. For perfect assembly and best picture quality ACT is using die-cast housings, specially for small pixel pitches. If a LED-displays is used outdoor, during direct sunlight it will get very hot inside the cabinets.. ACT videomodules are build with thermostat controlled, adjustable fans, situated at the back side. Dependent on the installation area it can be reasonable to use air conditioner, for sure in this case you must then close your underconstruction. A big challenge for outdoor LED-screens is the brightness. Our outdoor solutions with a brightness of 5500 to 8000 cd/m² are perfect readable under direct sun. Of course automatically always with the right led brightness controlled by an intelligent, programmable dimmer system. That´s important to get not in troubles due too high light intensity in the dark, and often brightness environments are different from place to place at night. That´s why also the brightness range can be adjusted. Human eyes can distinguish up to 16,7 Mio. colors, of corse all these colors you can see on ACT screens. The video-display can more, it´s possible to show up to 1.072741824 colors, this means more then you can see with your own eyes! Perfect picture quality on every brightness ambiance with high grayscale grading. But colors are not the only attribute for led-videowalls. On third less leds and the sign could be convenient solution. Sometimes for example no blue leds needed, in this case a multicolor display can be a perfect solution. All other videowall benefits like art of controlling, display functions, perfect bright colors, big viewing angle …. are still the same as for fullcolor videowalls. On Single color videoscreens you can see up to 256 greyscales of one colour. We offer mono-color screens with white, red, blue, green, yellow leds. For sure it´s also possible to produce a screen where you have on different areas seperate single colors. Already with small sizes often amazing potential solutions can be realized. For our special “Edelweiss” series we are using white leds, that´s then a very nice and exclusive black and white look. ACT LED videodisplays are available in a wide variety of sizes and configruations. A pixel pitch between 4mm to 150mm, virtual pixel technology or physical controlled, sizes from 2 m² to more than 200 m², everything is possible. Perfect also for unusual formats, it´s also possible to control different parts of videowalls together as one big screen. That´s often a amazing effect. Together with architects and artists extraordinary solutions could be developed and realized. For a edge length up to two meterACT offers cabinets with integrated air-pressure arms for easy front maintenance. For bigger sizes, if front maintenance necessary, of course other solutions available. ACT is your partner for flexible and mobile solutions of led videoscreens. 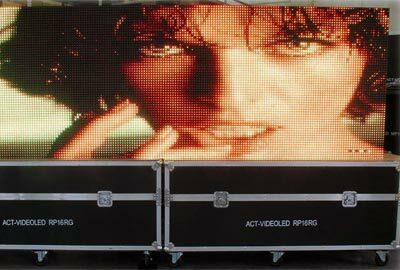 Wether big videowalls on trucks or trailer, professional rental systems for stage using, removable ledwalls …. just ask us, we have the experience! Big videowalls are a must-have on more and more events, they are dynamic and high-impact media tools, perfect for public viewing. Our different mobile solutions are all designed for fast mounting or ready to use and are excellent readable under direct sun. With videowalls manufactured by ACT each meeting becomes more attractively, more dynamic and more excitingly. People are supplied with brilliant big pictures and videos,everyone is placed “in the first row”. “Mobile profi” modules for rigging and stacking with draw-latches on each of the sides for an easy and very fast assembling. These cabinets are self-carrying, that´s the big difference to our “mobile-light” models, means no sub-construction on the back-side needed, centring and looking system for extreme fast built-up, each unit with his own controller, function ready. Delivered with special designed flight-cases, the modules can be fixed together directly on the flightcases, no need to put them out. That´s our superior high-end solutions, excellent for professional rental use. Mobile screens on trailers or on trucks are a second kind of mobile used videoscreens. The videowall can start to play within a few minutes after arrival. No special construction is needed, the videowall can be used nearly everywhere. Also no troubles with bad weather conditions as the screen must not assembled together. Mostly there is an hydraulic system on the wheeler for lifting, to turn, to bend … for most flexible use. If wanted, also a stage on the truck can be built in. A lot of different possiblities. We hope, this first brief introduction to the world of LED-videosigns has given you a first impression about the big possibilities. More details you will also find in our download-area or you just contact us, we will provide you directly and fast with more infos for your videowall-project.